By actually producing a flow of air, wind tunnel-based fluid experiments (EFD: Experimental Fluid Dynamics) make it possible to obtain highly reliable data but include problems like high preparation costs and limited information. Conversely, in recent years, the numerical simulation of flow fields using super-computers (CFD: Computational Fluid Dynamics) has enabled users to obtain large amounts of information at relatively low costs - but not always with adequate levels of reliability. 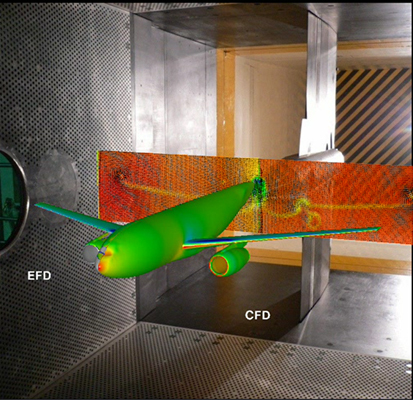 In response, JAXA's Digital/Analog-Hybrid Wind Tunnel (DAHWIN) predicts aerodynamic performance more accurately and makes the development of aerospace vehicles more efficient by fusing EFD and CFD in a complementary fashion. DAHWIN makes it possible to perform the following types of analyses with higher precision and higher efficiency than ever before. The development of DAHWIN began in FY2008. After applying for trial operations for the wind tunnel testing of re-entry capsule and D-SEND#2, the system was successfully completed at the end of FY2012. Currently, DAHWIN is operated in combination with the JAXA 2m x 2m transonic wind tunnel and the JAXA Supercomputer System (JSS). In addition to using DAHWIN in research and development activities, JAXA will contribute to the development of next-generation aircraft and spacecraft through DAHWIN. FLIGHT PATH No.1/2 "DAHWIN, a wind tunnel in the near future"